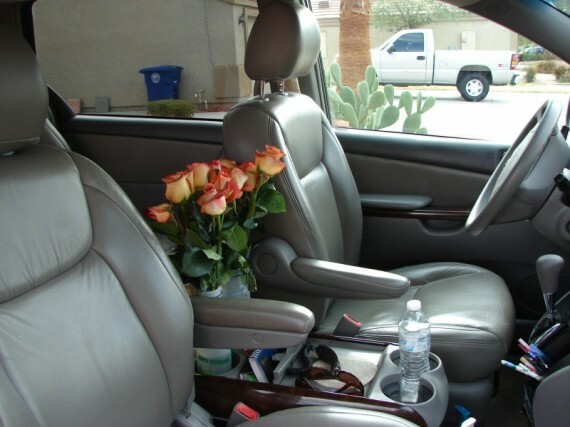 Before going to bed last night, we made a logistical change to today’s itinerary. 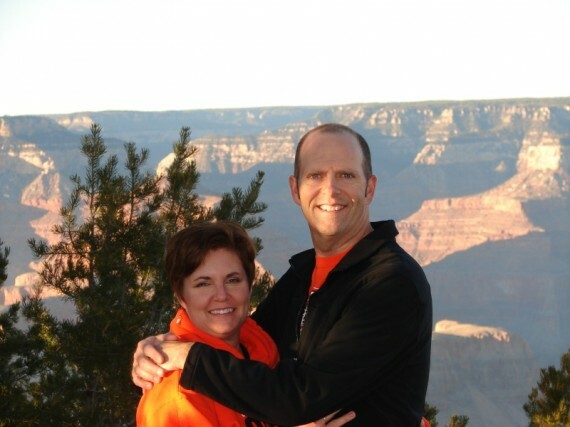 Instead of leaving Phoenix early, spending the entire afternoon at the Grand Canyon, and heading on down the road, we decided to sleep in and spend the night at the Grand Canyon. When we got up at 9 am, everyone else in our traveling party had already gone. Scott & Erin, KK & PK hit the road by 7 am, and Joe & Judy left around 8:45 am. While I was jealous of their ability to leave early, I don’t think Stephanie or I would have been coherent enough to do that. We locked up the vacation home and pulled out at Noon. Not too bad. 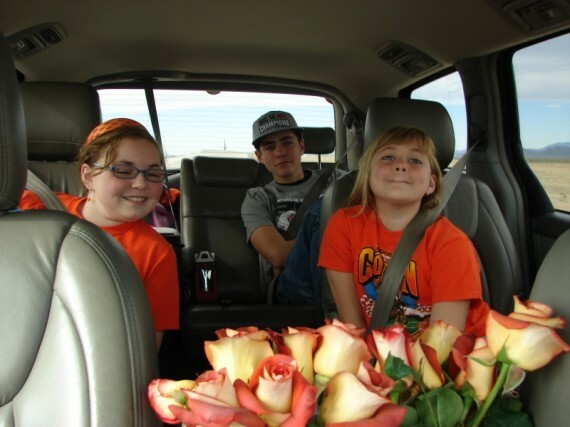 Orange Roses really spruce up a Road Trip. Just a few miles down the road, we passed a Maricopa County sheriff’s office. 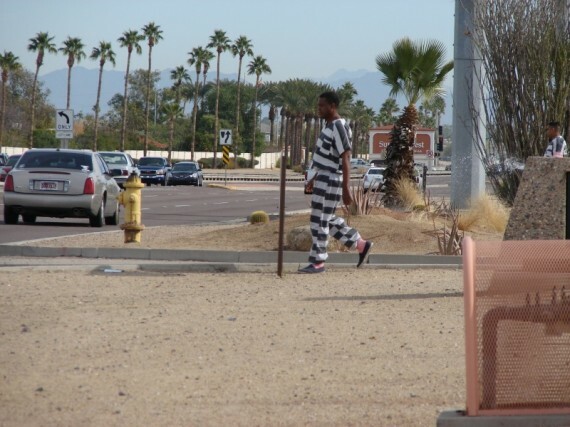 Out front were several inmates out picking up trash and watering the landscaping. Their outfits were something right out of O Brother Where Art Thou. This looks like a man of constant sorrow. 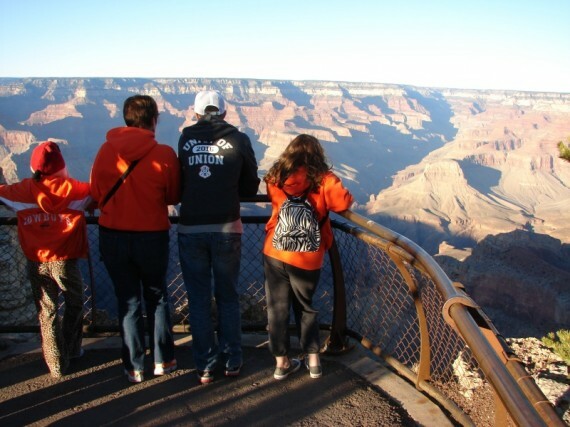 On our 4 hour drive north to the Grand Canyon, we passed a steady stream of other Oklahoma State fans. These were the fans that, like us, stayed up a little too late celebrating. Altered Reality: Things look so peaceful in this picture. For lunch, we stopped in Flagstaff and ate at a Del Taco. This qualifies as an exotic meal for us, since we don’t have these in Oklahoma. Stephanie and I got the fish tacos and for $2 apiece, they were top notch. 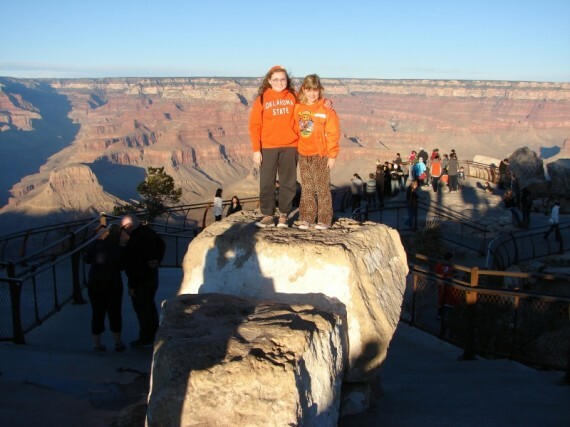 Like clockwork, we pulled up to the South Entrance of the Grand Canyon at 4:00. The admission was $25, but we have big plans to visit a number of National Parks this summer so we sprang for the $80 Annual Pass. That almost makes us committed to visiting some National Parks this summer. With around an hour of daylight left, the park was not very crowded and we were able to get good parking. There was quite an orange flavor at the park. 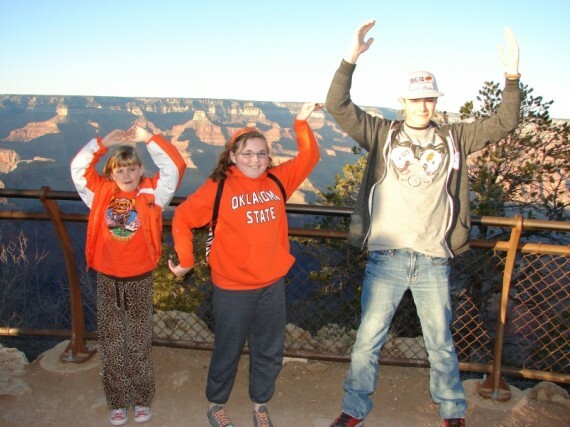 Even the park employee that sold us our park pass commented on how many Oklahoma State fans she had seen today. As we approached the first viewing area, Mallory wanted to create her own experience. She closed her eyes and I guided her all the way up to the rail, then she opened her eyes. She claimed it was very dramatic to do it that way, and I would believe it. Oh yeah, this was worth a four hour drive! 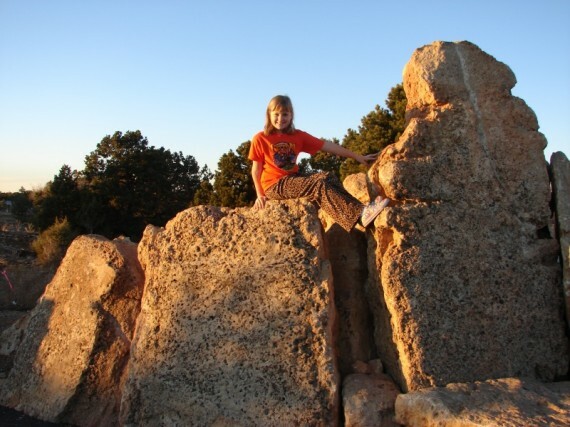 We soaked up the experience and spent time at every little lookout. 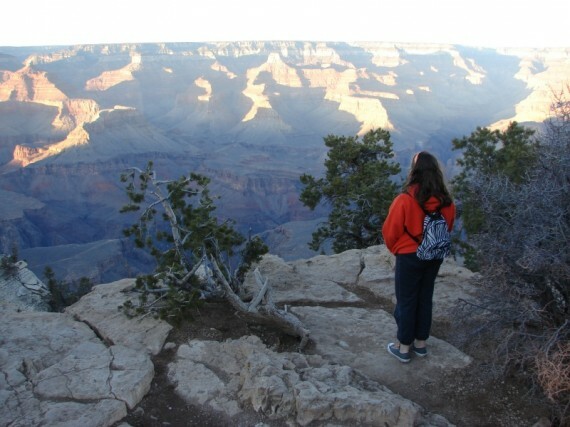 The views at sunset were truly spectacular. A couple of good looking King girls! After leaving the scenic vistas at the rim, we stopped at the General Store to browse the wide selection of memorabilia, as we are prone to do. We did not disappoint them. We drove back into the town of Tusayan, located just a few miles south of the park entrance, and checked into our hotel. The hotel had only one employee working the front desk, but he was getting everybody checked in pretty efficiently. When it was finally my turn at the desk, a European had walked up to the desk and complained that his keys did not work. While the clerk was fixing his keys, the European stated his room was Non-Smoking. I have never seen a hotel clerk show that much audacity to a guest. And I loved it! For dinner, we promised the kids some pizza. We settled into our hotel room and Marissa made a ToDo List. 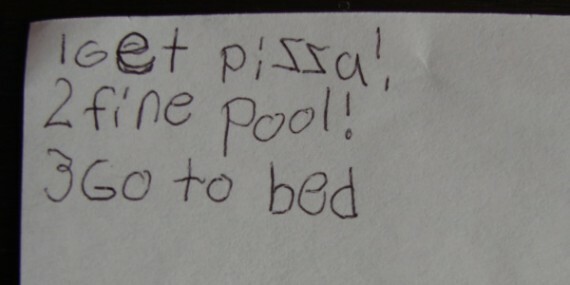 It included: (1) Get Pizza!, (2) Find Pool!, and (3) Go To Bed. Notice the excitement on the first two items and the lack of enthusiasm for number 3. Stephanie and I went on a quest for pizza, but in this one-horse town, the only pizza place was committing highway robbery. $20 for a large cheese, and up to $28 for a large supreme. Thanks, but no thanks. We bought all of us ice cream at the convenience store, and enjoyed those treats as dessert after a dinner of sandwiches and chips. After dinner, Stephanie and the girls put on their swimsuits and found the oversized hot tub at the hotel while Miles and I watched football in the room. By 10:00, we had the lights out and were ready to cross off # 3 on Marissa’s ToDo List.